… is not the title of a novella coming out with Dreamspinner in June 2016. But it could have been. Had I been more committed to puns. And if ‘Tis Pity had ended other than with, like, murder. So much murder. My story – actually called Pastures New – is part of Dreamspinner’s Daily Dose for June 2016, A Walk on the Wild Side, which is a story-a-day collection of shapeshifter-flavoured m/m romances. 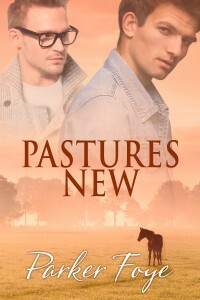 Pastures New will also be released as a novella. I had the best time writing this short, and working with Dreamspinner. After a su ccessful career as Illustrious Ruckus, three-time winner of the British Open, James Kirby has hung up his saddle. His experience as a horse in the eventing world doesn’t exactly translate to two legs, and he’s struggling to move on. James’s quiet days at the family farm with his sister, Matilda, are interrupted by Archie Ievins, a sports journalist visiting to interview Matilda and snap a few photos of Illustrious Ruckus. Archie quickly endears himself to the family and to “Ruckus,” and James falls head over hooves—only to be brought up short when his ex-boyfriend threatens to expose James’s secret. How can James start something new when he has four legs threatening to come out of the closet?